Ethernet 102: The Physical Layer of Ethernet is a high-level presentation on the basics of the Ethernet physical layer. This is one of the first webinars in the University of Ethernet program and investigates the physical layer from the cabling to the MAC layer. This presentation covers Ethernet nomenclature such as 10GBASE-LRM and signal encodings such as 10GBASE-R. From Fast Ethernet to 100 Gigabit Ethernet, Ethernet 102 shows real world examples of copper and physical interfaces. 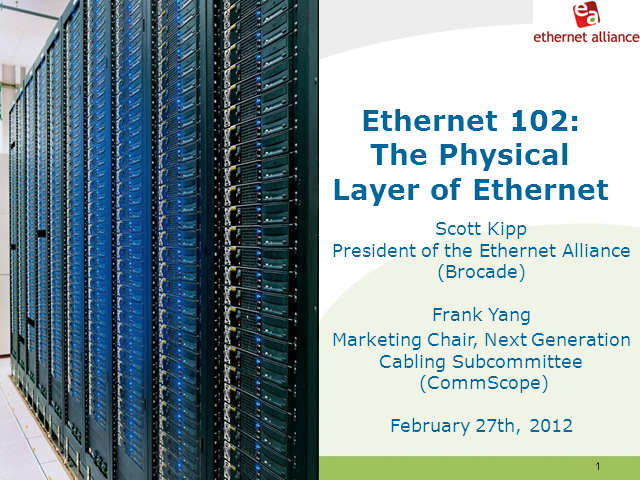 Ethernet Alliance - Scott Kipp, Brocade; Frank Yang, CommScope, Inc. Presented by: Ethernet Alliance - Scott Kipp, Brocade; Frank Yang, CommScope, Inc.